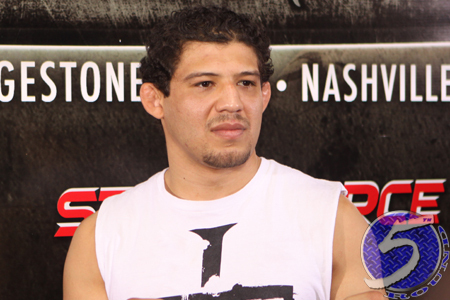 Prior to finally making his UFC debut in April 2013, Gilbert Melendez (pictured) was considered by most as the game’s top lightweight not competing in the UFC. Well, after just two outings inside the Octagon, it appears Melendez might be well on his way to reclaiming that moniker. On this week’s edition of “UFC Tonight,” reporter Ariel Helwani said negotiations for a contract extension between the UFC and Melendez have stalled. Actually, UFC president Dana White reportedly claims they are nearly dead. “I’m done. It’s not going well at this point. I like Gilbert Melendez very much, but I don’t like his management,” Helwani relayed from his conversation with White. “I couldn’t care less anymore. If Melendez wants to fight in the UFC, he should talk to [UFC co-owner Lorenzo Fertitta] quick. The UFC absorbed Melendez’s previous contract when they purchased Strikeforce. It is unknown if that deal was tweaked at the time given the promotion. Melendez’s contract expired after his instant classic unanimous decision victory over Diego Sanchez at UFC 166 in October. It was clear White wasn’t expecting this much resistance from the former Strikeforce lightweight champion in terms of an extension, particularly since Melendez was merely 1-1 in the UFC, as they already assigned Melendez his next opponent before putting pen to paper. They even had Melendez on UFC 170‘s official event poster to fight undefeated Khabib Nurmagomedov. However, the bout was scrapped shortly after the leaked billboard made its rounds due to the contract snag. Melendez owns a 22-3 professional record. He was riding a seven-fight winning streak into his UFC debut, which resulted in a decision defeat to then-lightweight champ Benson Henderson.